With summer almost upon us, the following is a list (in no particular order) of books that caught the attention of those in the know as strong contenders for your reading time. All are or will be available shortly within the library system. Have a great summer! 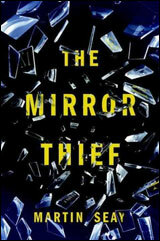 The Mirror Thief, by Martin Seay – part supernatural mystery, part ominous modern thriller, and a true delight. Zero K, by Don DeLillo – DeLillo packs death, information, mannequins into one of his finest books. I Almost Forgot About You, by Terry McMillan -There’s no better creator than McMillan of female characters who refuse to give up on dreaming, or on looking back to find the way forward in their noisy, messy, joyous lives. Marrow Island, by Alexis M. Smith – Smith suffuses her setting with dread and menace, raising the question: What is really happening on Marrow Island? The Heavenly Table, by Donald Ray Pollock – a psychotic terror ride through an early 20th century hillbilly hellscape that puts the family of a swindled, good-hearted farmer on a collision course with three brothers on a crime spree. Sweetbitter: A novel, by Stephanie Danler – A lush novel of the senses—of taste and hunger, seeing and understanding, love and desire. Heat and Light: A Novel, by Jennifer Haigh – To drill or not to drill? Prison guard Rich Devlin leases his mineral rights to finance his dream of farming. He doesn’t count on the truck traffic and nonstop noise or the disruption of his family’s life. We Could Be Beautiful: A Novel by Swan Huntley – a glittering, seductive, utterly surprising story of love, money, greed, and family. Trail of Echoes Rachel Howzell Hall – Detective Lou Norton investigates crimes against exceptional African American girls who belong to the same school district. The Sport of Kings, by C E Morgan – Hellsmouth, an indomitable Thoroughbred with the blood of Triple Crown winners in her veins, runs for the glory of the Forge family, one of Kentucky s oldest and most powerful dynasties. spiraling tale of wealth and poverty, racism and rage, “The Sport of Kings” is an unflinching portrait of lives cast in shadow by the enduring legacy of slavery. Ladivine, by Marie N Diaye, translated by Jordan Stump – A trio of women create, discover, and keep disappearing on each other in this melancholy modern fable. Imagine Me Gone, by Adam Haslett – This touching chronicle of love and pain traces half a century in a family of five from the parents’ engagement in 1963 through a father’s and son’s psychological torments and a final crisis. Sweet Lamb of Heaven, by Lydia Millet – Blending domestic thriller and psychological horror, this compelling page-turner follows a mother fleeing her estranged husband. The Adventurist, by J Bradford – A brilliant, introspective, socially awkward software engineer navigates corporate and personal challenges. The writing is just about perfect: incisive, eloquent, philosophical, and witty by turns, a top-notch talent. This entry was posted in Recommendations, Uncategorized and tagged adult fiction, recommendations, summer reading by ccld. Bookmark the permalink.